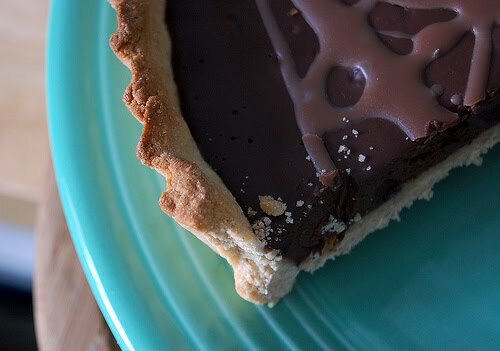 In my opinion, this recipe yielded more of a pie than a tart . . . and I attribute this result to my inexperience with baking either treat. Regardless of what you call it technically, it's VERY good. I'm talking amazed-because-it-tastes-like-something-I-would-order-at-a-fancy-restaurant good. The shell is modified from a recipe in Martha Stewart's Baking Handbook. The filling is something I concocted using various recipes from books and the web. If you want to make a true tart, don't do what I did and 1.) freak out because the dough is, at first, crumbly . . . 2.) add more liquid (and, sigh, butter) to compensate . . . and then 3.) relish in its sticky glory thinking you've done something to help the situation. The dough should NOT be sticky. As Martha explains on page 225 of her book: "It's very important not to overprocess . . . the texture of the dough should be crumbly and just hold together." But, if you freak out like I did . . . add a bit more soy milk . . . butter . . . it's not the end of the world. 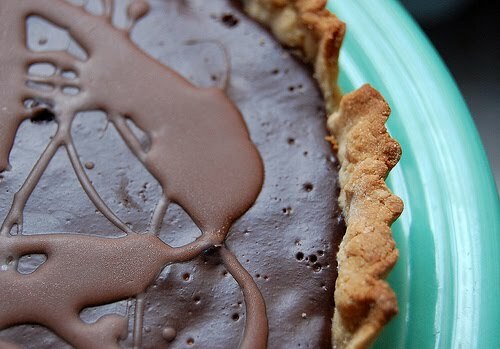 You'll just get a (brag worthy) pie-tart hybrid. 6 tablespoons unsalted butter, room temp. In the bowl of an electric mixer fitted with the paddle attachment, combine butter and confectioners' sugar. Mix on low speed until combined (2 minutes). Add egg yolks, and mix until incorporated (1 minute). Add 1/2 cup wheat pastry and 1/4 cup coconut flour and mix on low speed until the flour is just incorporated (30 seconds). Add the rest of the flour -- along with the salt and soy milk. Mix until the flour is no longer visible (1 minute). Turn out dough onto a piece of plastic wrap. Shape into a flattened disk. Wrap in plastic and refrigerate for at least 2 hours (or overnight). The dough can be frozen for up to 1 month -- but thaw overnight in the refrigerator before using. 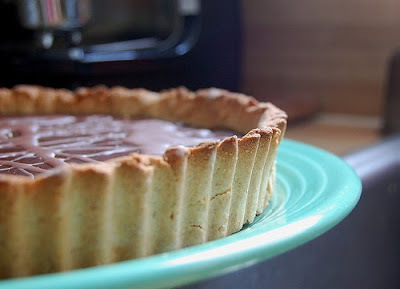 To bake you'll need a tart pan -- preferably with the movable bottom. It's early, and I can't think of a better term. Just before your two hours are up . . . preheat the oven to 375 degrees F.
Roll out dough to its proper dimension (about 1 inch bigger than your tart pan) and drape over the pan. Press the dough into the pan to fit and then use a rolling pin to trim the dough by gently rolling it over the top. Prick the dough all over with a fork . . . and bake for about 10 (to 15) minutes . . . or until edges are golden brown. Filling ingredients . . .
You'll want to lower the oven temp to 350 degrees F once the tart has initially baked. In a small saucepan (on high heat) -- whisk together the soy milk, sugar, and coconut flour. Bring to a boil. Pour hot mixture over the chocolate chunks and blueberries. Whisk together until smooth. Right before you pour the filling into the tart, whisk in the egg (again until smooth). Pour mixture into the tart. Bake for 10 (to 15) minutes -- or until the edges have begun to set. Move to cooling rack. 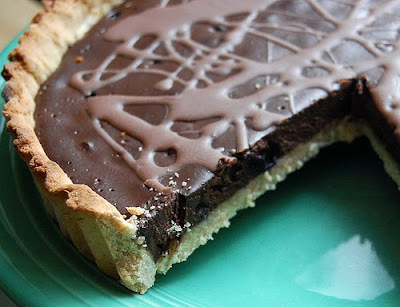 Drizzle with melted milk chocolate. And have a fantastic day!